Provides an extra strong, durable, shock-resistant bond. Works on ceramic, glass, metal, plastic, wood and rubber. Precision tip applicator has an extended, no-clog tip. Easy-open, easy to seal hanger cap. Note: A minimum quantity of 336 must be ordered, and in units of 48 thereafter. 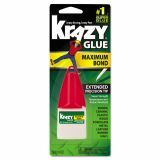 Krazy Glue Maximum Bond Krazy Glue, 0.18 oz. 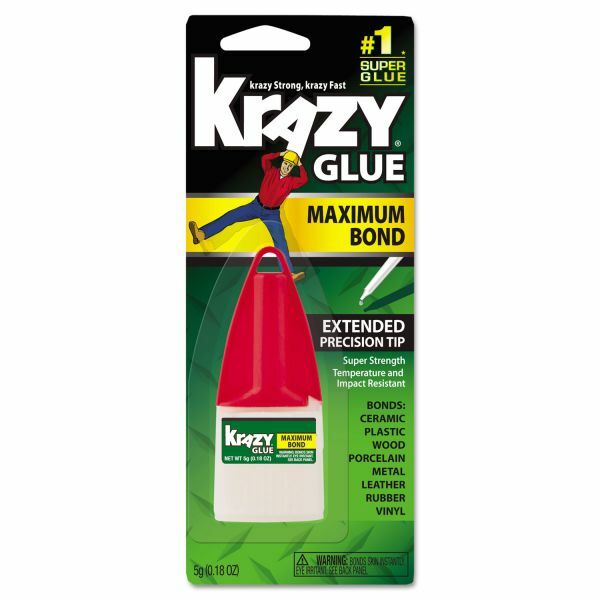 Extra Strong, Durable, Precision Tip - Extra-strength, advanced formula Krazy Glue provides an extra strong, durable shock-resistant bond. The precision tip applicator has an extended, no-clog tip with an easy-open, easy-seal hanger cap to reach tight spots. The large size and sure-grip panel on the container make it easy to apply. Ideal for ceramics, wood, plastic (PVC, ABV, ERP), rubber, metal, and glass. Larger size and sure-grip panel on the container makes it easier to apply.